An exotic destination famous as a melting port of religion, race and cuisine, cruises to Malaysia are an exciting fusion of colourful culture, fascinating history, scenic landscapes and exotic cuisine. A comfortable and convenient way to travel, cruises to Malaysia make travelling to and navigating your way around a foreign country much easier. Full of surprises, Malaysia contrasts modern cities and architecture with rich history, ancient reefs and a host of beaches and natural attractions. Visit Kuala Lumpur, Penang, Kota Kinabalu and Langkawi and explore the colourful festivals, gastronomic delights, stunning islands, beaches and natural attractions of Malaysia. Malaysia is a vibrant combination of rich culture and striking modern lifestyle with a range of attractions as diverse as the country itself. From historical museums and art galleries to animal parks, gardens, forest reserves, temples, zoos, aquariums, theme parks, golf and country clubs, shopping and markets, whatever you’re looking for, you’ll find it in Malaysia. The capital of Malaysia, Kuala Lumpur is an exciting cultural centre boasting the state-of-the-art aquarium Aquaria KLCC showcasing over 5,000 aquatic and land-based wildlife exhibits. The KL Bird Park is another popular attraction with over 50 species and 5,000 birds in a 20 hectare free flight aviary. Another must-see attraction is the KL Tower, an icon of Kuala Lumpur’s skyline. Towering over the whole city, it offers 360 degree views. Similarly you can’t miss the Petronas Twin Towers, famous for their incredible 88 storeys and Skybridge attraction. The twin towers are a particularly impressive sight when lit up at night. For a shot of culture, the Batu Caves are just 20 minutes outside the city and offer a sacred Hindu temple and shrine featuring 272 steps and a humongous statue of Lord Murugan at the entrance. The nearby island of Penang also offers some fantastic attractions including its historic colonial capital of Georgetown. Offering top heritage sites including Khoo Kongsi and Pinang Peranakan Mansion, you can discover architectural gems said to be more than 100 years old. Explore some of the most popular tourist spots on the unique open-fronted 3 wheeled pedal-powered trishaw or take a scenic night tour to experience the sights, sounds and tastes of Penang lit up by the twinkling city lights. 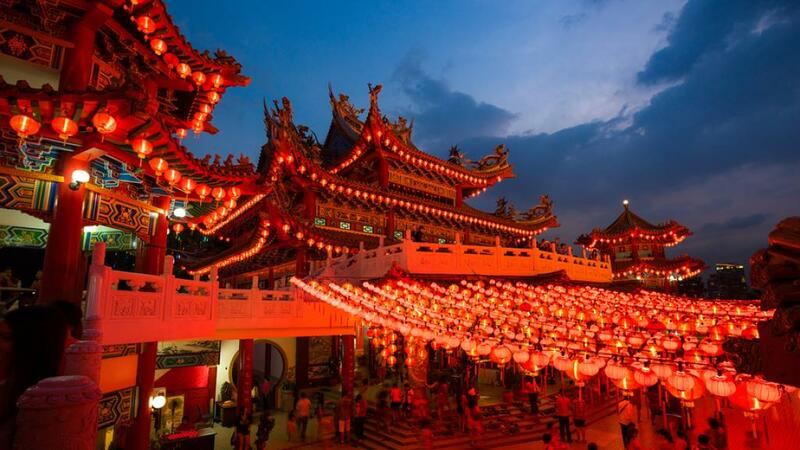 Don’t forget to visit The Pagoda of Ten Thousand Buddhas, known as Kek Lok Si Temple and enjoy a funicular train ride to the top of Penang Hill. A stunning resort island on the northern tip of Malaysia, Langkawi is a popular holiday destination and cruise port. Close to the Thailand border, the island features pristine beaches, tropical rainforest and lush jungle as well as a variety of wildlife and natural attractions. If you’re ready to relax, then a bird watching trip is a wonderful way to see the scenic landscapes of the island and spot over 230 species of colourful and migratory birds at your own leisurely pace. For a more diverse range of wildlife, a mangrove safari offers everything from monkeys and monitor lizards to stingrays and white head eagles. Ride the cable car, check out the rice gardens and relax at the waterfalls around the island. Throughout the say you can swim, snorkel and fish in the waters around the island but be sure to stick around for sunset, as the views really are amazing.